That’s what I see when I look out my window now. Empty paddocks. There are horses, still. Six of them. Two will leave at the end of the month. The remaining four are mine. They will stay. And I will have time to give them the attention they deserve. 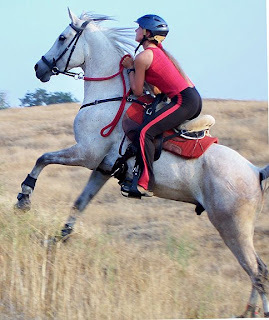 Six years ago, I started this blog with a dream of promoting the Barbs by riding them in endurance. Colleagues in other states would train and promote other Barbs in other ways. My breeding stock would be available to help meet growing market demand through commissioned foals. 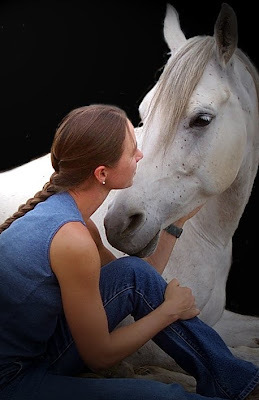 I spent endless hours working with the horses, all of which came to me virtually untouched. I trained them one by one, chronicled triumphs and frustrations, solved dilemmas ranging from recalcitrant attitudes to ill-fitting hoof boots. I took them down the endurance trail. They did fine. Not spectacularly, but respectably. They did fine. Meanwhile, the market changed. The Great Recession cut into nearly everyone’s lifestyle. 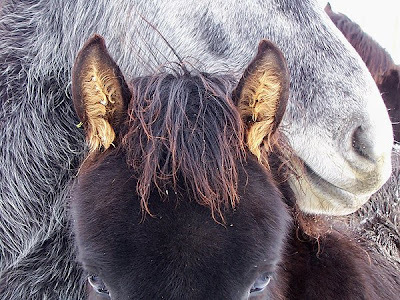 Raising and selling horses was never an easy business, but now it grew even harder. 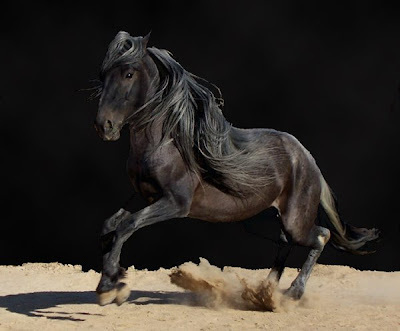 Especially for a small, hot, “boutique” breed without a long performance record in an area that focuses on stocky, quiet, Quarter Horse types for western sport. In other areas, fellow breeders seemed to be collecting stock but not really using their horses. Word was not getting out. Interest was not growing. And I changed. I wanted to focus more on endurance and less on training. I wanted to go faster down the trail than the Barbs wanted to carry me. 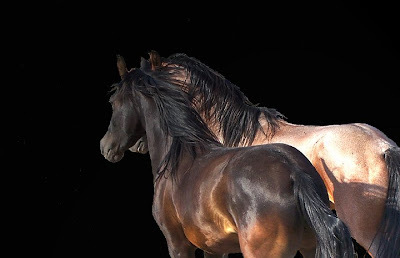 It took years — literally years — to release the old dream enough to buy a pair of Arabians for my endurance mounts. When I did, I was glad. But what to do with the Barbs? I loved them as a breed. I loved them as individuals. 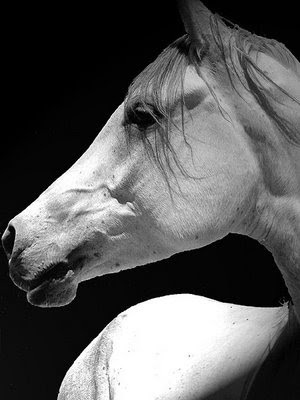 I had two, world-class stallions, five lovely mares, and a gelding that, while stunning, didn’t seem suitable for endurance. 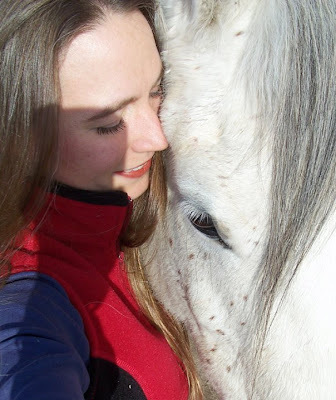 I also had a single income, a fun but wildly busy life, and too much awareness of what happens to unwanted horses to even consider breeding foals that I didn’t have time to train and that the market simply wouldn’t bear. Nobody ever wants to quit mid-race. It usually feels like failure. But life has taught me that what looks like failure often is not. Journeys left unfinished were not taken in vain. (Remember this post?) Dreams shift. We carry treasures with us from memory to motivation. And so, after months of consideration, I made a decision. I would pass the Barb breeding torch to others. Insider and Acey went to Wisconsin. Tuetano is with a trainer who is preparing him for travel to his new ranch in Texas. Incognito (rechristened Inara) is with a Barb enthusiast here in Idaho. Consolation and Sandstorm leave for Colorado next month. CJ is with an Idaho family, soon to be started under saddle. 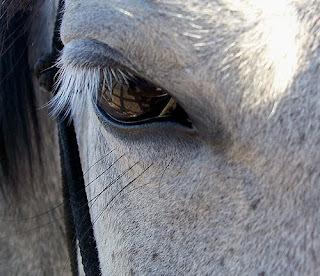 All except CJ (a gelding) remain in the Spanish Colonial horse community. They went to homes of people I have known for years. They are safe. They are valued. They’ll be used to preserve and promote the breed. And the empty paddocks? I’ll tear some out to make room for a barn. Others will house Jammer, Maji, Ripple (yes, I kept one Barb), and the new mare I picked up as guest mount for less experienced riders. Those empty paddocks are sadness, but they are also deep relief. They represent the end of guilt over having such fine horses and not using them. A gift to the breeding community. Lower hay costs. Attention freed up for the horses that remain. And especially, more time to ride. It is, after all, called Rider Option. Hello, old friends! I am not dead. Yeah. Just about everything I did last year required a helmet. Even Halloween. I have so many helmets that I’ll soon need to buy a bigger house just to store them all. But never mind that. It’s almost time to gear up for the 2014 endurance season! Jammer earned himself 310 miles during his first year in the sport. He’s had a nice, winter break and is raring (not *quite* literally) to go for more in year two. 1. Survive Maji‘s first 50 — and several more! 3. Get Ripple and Incognito well started under saddle. I may hire someone to do this so that I still have time to wear all my other helmets. 4. Sell some more Barbs. I know. Heartbreak. But it’s the right choice for everyone. More on that later. That’s enough. I’ve learned not to be too specific. You never know what’s going to happen. So. Grab your helmet(s) and come along for the ride. I rode Consolation yesterday. It was her first outing since I laid her off at the beginning of last summer due to her undiagnosed, but obvious, discomfort under saddle. We jogged six miles in the sunshine. She felt good. Content. But not like an endurance horse. Never one of my most driven mounts, she felt distinctly disinterested in speed and distance. I doubt I’ll attempt to condition her this year. Or ever. She gave me 875 endurance miles, plus countless more in training. That will have to be enough. Here is the dark side of being goal-oriented. I struggle to give up on this mare. On anything. It is easy to forget, when I fail to reach my destination, the views I enjoyed along the way. My reaction is common, I suppose. It is also a failure of perspective. Consider this: What is the destination? When does effort become achievement, striving morph into success? Is it at 2,000 AERC miles? 5,000? If I retire a horse at 1,655 miles, have I somehow failed? If a career path fizzles before I reach the corner office, was my experience wasted? If a relationship crumbles after three years, or five, or ten, have I thrown away that time? Yes, I am older now. Yes, it takes effort to update my resume, go out and date, start a young horse, shoulder the effort and face the fear of starting over, starting new. But see the good times had, the completions earned, the accolades received, the scars that strengthen! They don’t vanish because the path on which I found them ends in a cliff. A journey abbreviated is not a journey obliterated. The treasures I claim are mine to keep. Don’t waste the litter of your past. It gathers about your feet like shale tumbled down a hillside. Step up on it. Feel it shift beneath your soles, and climb. Squint against your tears, my friends. See the shining? Reach out. Take hold. Climb. Success requires the alignment of your actions with your intentions. It’s been tough, because I really enjoy this horse, but I have decided to make CrackerJack (aka “CJ”) available for sale. He’s Consolation’s 2006 colt (gelded) by Jack’s Legacy and will make someone a striking mount. The kid has presence, and he can MOVE! CJ is super fun to handle — both exuberant and polite — and I’ve been spending a fair amout of time with him lately. He’s just about ready to start under saddle, so your best bet on price is to claim him now. Click over to the Sale Horses page for details and additional photos, and please feel free to pass the link around to anyone who might be interested. 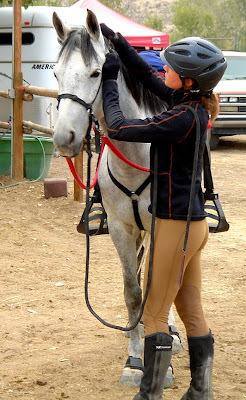 It feels strange to be preparing for a ride without packing tack, or feed, or a horse. To take only the truck, with no trailer. To go without Consolation. Since Fandango, I have taken Consolation to the vet to determine why she hasn’t been herself lately. We don’t have a clear answer on #3 yet, but it appears likely that she has stifle issues. How bad? We don’t know. Maybe bad enough that she’s done with endurance. I am trying to absorb this. I am also trying to hold onto a little hope, but not too much, that it isn’t as bad as we think. X-rays are scheduled for Monday. In the meantime, I am grateful to have a couple really good friends. The three of us had been planning to ride the 75 at Spring Fling tomorrow. I was going to take Consolation, of course. But, as it transpires, one of said friends has offered me her second horse instead. 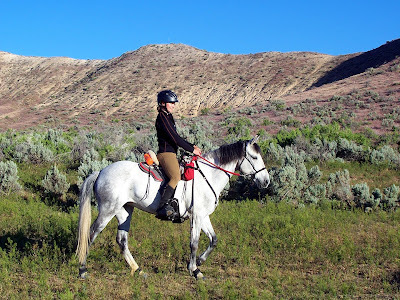 Blue is the sweet, gray Arab I rode a couple days at Canyonlands last fall. I like him. It’s bittersweet, looking at my first 75 without my own horse. But I couldn’t ask for a better substitute. Friday night, after the ride meeting, I slathered clay on Acey’s legs and went to bed. The sky was dark with clouds. It rained. Though I slept well, I woke on occasion to note that it was still raining. Near dawn, it quit. And then, just as my alarm sounded, it began again. The rain. I fed the horses and myself. It rained. I tacked up Consolation. It rained. I joined Karen and Blue for the short walk to the start. It rained. We walked our excited horses for a bit, then mounted up and set off trotting. In the rain. We climbed up to the flats, where the ground stretched sodden and bleak beneath iron skies. 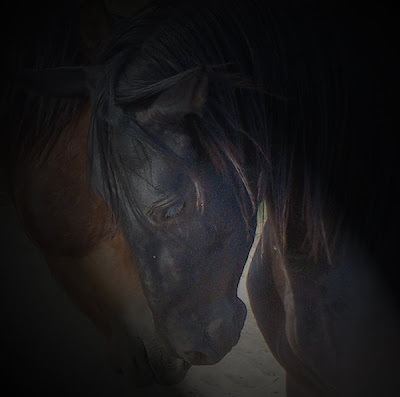 Wind drove heavy raindrops into the horses’ faces. 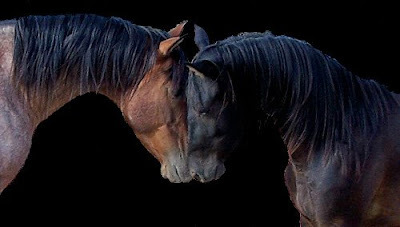 They trotted with their muzzles twisted sideways and ears alternating between forward eagerness and backward annoyance. Blue seemed more bothered than Consolation, who cheerfully took the lead. She was obviously delighted to be out of her pen. We covered almost the entire first, 25-mile loop at a brisk trot, circling back for a hold in camp, where the rain had miraculously let up. 50 minutes later, having changed into dry clothes and warmed our hands by the camper heater, we were headed back out. In the rain. It rained as we picked our way — much more slowly now — across a series of “whoop-de-woos.” These washes, crossed perpendicular to the flow, require the horses to ease down very steep hills of a horse’s length or two, then climb immediately back up the other side. It can be tricky at the best of times. In the rain, or more particularly the mud, it was downright challenging. 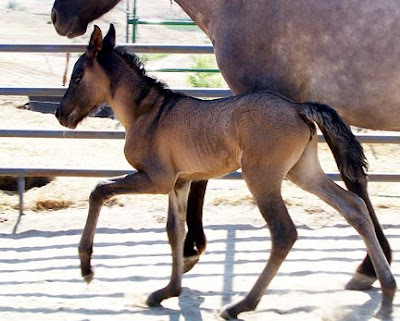 On one uphill scramble, Blue lost his footing and went briefly to his knees while his hind feet struggled for purchase. He recovered himself admirably while I, coming along behind, quickly redirected Consolation up an alternate path. Still and endlessly, it rained. Finally, we passed the whoop-de-woo section and were able to trot a little way to the creek. It seemed like we’d been out there forever, but I knew exactly where we were and how long the loop ahead was going to be. At least, I thought I did. Sure enough, the ribbons led us across the creek and down a stretch of road, then back to trail and a long sand wash. What I hadn’t counted on was the dramatic impact of all that rain. The desert, which dries quickly when given the chance, hadn’t had sufficient relief to absorb the storm. Her soil had turned to deep and greasy mud. The loop suddenly looked much longer. Trotting was out of the question, at least for those of us who cared more about our horses’ soundness than our finishing times. The sand wash, though not slick, was much deeper than usual. We walked it, too. And then came the stretch of deep and cloying mud that the horses picked through in boots caked with pounds of clinging clay. Off and on, it rained. 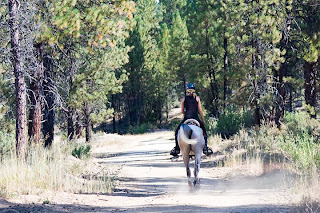 We re-crossed the creek and washed off a little of the clay, but plenty came with us as we splashed — trotting at last — along single track back toward camp. As we passed the old homestead, Blue tore the gaiter off a hind boot and continued without it. We climbed the knife ridge in biting wind. I was dressed properly and didn’t get cold, but still I was glad to reach the final stretch of two-track before dropping down the slide to camp. We crossed the flat in fits of trotting, pulling up frequently to march through patches slick with mud. We dismounted to walk down the slide, then mounted up again for a triumphant trot along the last mile to the vet. Consolation earned all A’s and appeared pleased with herself. Despite the adverse conditions, I thought she’d taken on the ride with more enthusiasm than usual. I’m quite sure she appreciated the fit of her new Stonewall. The ride manager said twelve people (so far) had commented that this was the toughest 50 they’d ever done — but Consolation had made it feel pretty manageable. There’s no question our slow, safe pace on the second loop helped. I cleaned up my horse, plied her with blankets and feed, and even found time for a hot shower before awards. During which, of course, it rained. So. I decided to ride Acey on Day 1. Gotta get it overwith sometime, right? Besides, out vet checks and two holds looked like the way to go for a first-timer with a buddy in camp. Laurel and Buffy offered to let us join them, along with Linda and Ted, for a slow ride at the back of the pack. Perfect. The night before split itself between wind and rain. I slept little enough to observe the passing storms, a victim of new-horse nerves, though I must say I wasn’t nearly as restless as I used to get. 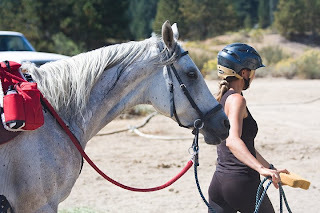 I was confident that Acey was mentally ready for the trail itself, and that she’d eat and drink well throughout the ride. But how would her fiery, emotional side affect her at the start? What would happen when we reached the creek, only a mile out? 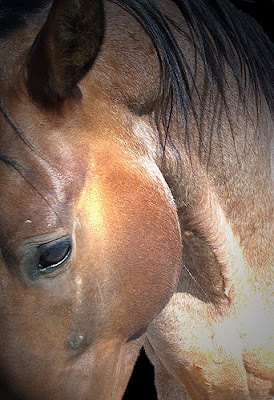 Acey is a heart-on-her-sleeve kind of horse, and she doesn’t always react calmly to new and intense experiences. Near morning, the rain stopped. I let myself hope for a dry start. Alas, before my alarm went off at 5:30, the rat-a-tat tapping on the camper roof started up again. And increased in volume. And so, we tacked up in the rain. I applied several wraps of duct tape to Acey’s Back Country boot gaiters, cursing the dampness that already threatened the likelihood of them staying on through mud and miles. Acey alternately shivered and danced in place, but at least she continued grabbing mouthfuls of hay. The chill and nerves were getting to her, and I was glad when the starters sent the bulk of the horses on down the trail. Acey seemed fairly calm there by the trailer, so I mounted up…and quickly got off again as a glimpse of the departing herd sent her emotions skyward. Right. We’d start out in hand. Along with Laurel and Linda, we headed down the road, Acey dancing and fretting at my side. She didn’t resist leaving camp, but she was a nervous wreck and spooked dramatically when a couple other, late starters crested a small hill behind us. We walked on and the moment she was reasonably settled, I stepped aboard and asked her immediately to trot. All that energy needed to go somewhere, and a rational, forward pace made the most sense. We reached the creek still jumping with nerves, but comfortably under control. I moved Acey close behind her new friends Buffy and Ted, and (glory hallelujah!) she walked right through the knee-deep stream without batting an eyelash. Soaked from above by falling rain, soaked from below by our saturated seat covers, but triumphant to have survived the toughest part of the ride — the start — we climbed out of the canyon and struck up a merry trot along the ridge. Acey travelled with her ears up and eyes bright. She managed the early climbs and descents handily, and my only worry was the frequent clopping of her boots against one another. She doesn’t forge badly barefoot, but the too-large boots affect her breakover and I feared she would lose them, particularly in the muddy conditions. Sure enough, we weren’t 5 miles out before we had to backtrack in search of a boot — the left front. Or maybe it was the right front. Either way, it constituted an inauspicious beginning — and belive you me, it was only the beginning. We now had one boot with no tape. I tried re-taping with a roll of duct tape from my saddle bag, but Acey was in no frame of mind to stand still. The gaiter was hopelessly damp and sandy anyway. I strapped it on, sans tape, and crossed my fingers. [Note: finger-crossing is no guarantee of success.] Somewhere around mile 7, I gave up on keeping that errant boot on Acey’s foot. Having no room in my saddle bags because I’d filled them with water bottles, I managed to tied it to the back of my Stonewall, which wasn’t easy because BCs don’t really offer anything to tie to. It rode there for a while until the footing got rockier and I tried putting it on again. 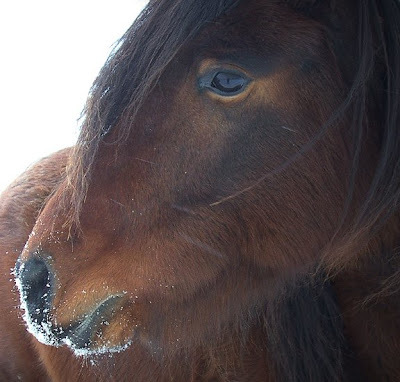 Somewhere along the line, Linda’s horse lost one of his Gloves. And then, as we trotted briskly across another flat stretch, the real adventure began. Acey’s head went up and her ears went back. Her hindquarters came up beneath me and I just had time to say “Guys, something’s really bothering her” before she bolted. Zoom! Up the trail we flew! I chucked the hoof boot I was carrying and tried to rein her in. Not a good move, apparently. All that energy went up instead of out. 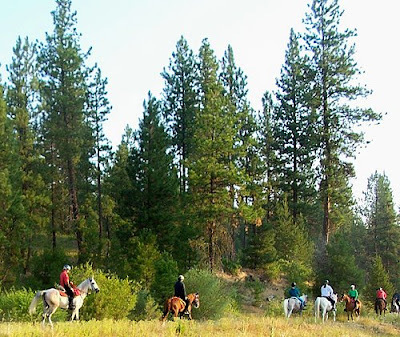 I’m told we made a rodeo spectacular as we bucked through the sagebrush, circling back toward our companions. I stayed on…stayed on…stayed on…and came off. I was on my feet again before I registered that I’d hit the ground. Acey waited nearby, watching wide-eyed and bare on yet another foot. I concluded that the boot had come off but the ring of duct tape had clung to her fetlock, causing her to spook in the first place. We searched briefly for the missing boot, but gave up before long. The loop was taking forever and we had a good 40 miles to go! Now Laurel and I each carried a boot, Acey wore one, and the fourth was never to be seen again. As we trotted on, I pondered the fact that I seemed to have landed right on the top of my head. Neck stiffness would surely ensue. Chiropractor, anyone? But first, we had to get through today. And tomorrow. And maybe the next day as well. All this assuming that I wasn’t forced to pull due to equipment problems. You guessed it. Acey lost her last boot before we reached the check. Linda carried it for us. At least it had stopped raining. And, we were having fun. Really. Because we’re crazy like that. Sure enough, the second, 25-mile loop went off without a hitch. Halfway around, black clouds rolled over to drench us with rain and pelt us with hail, but the storm passed on a rush of wind and we arrived at the next hold with reasonably dry clothes and happy horses. Acey again vetted with all A’s except a B for gut sounds, which I knew would rekindle as soon as she had a chance to dig into some much-desired feed. Indeed, she ate and drank well and continued to look content and eager to move on. Only 12.5 miles to go. Home free, right? Sure…until we mounted up and started walking out of the vet check, and someone lifted a big water tub directly behind Acey. It wasn’t too close behind her — the person didn’t do anything stupid — but Acey’s ranch-raised brain isn’t used to all that human activity. A replay ensued. Bolt, attempt to pull up, buck. Stay on…stay on…stay on…come off. This time, I landed on my back. 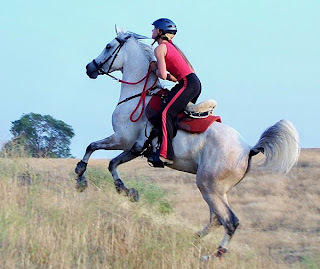 Again, I hopped up and back astride before Acey seemed to realize what had happened. She was still shaking and water tubs were still being loaded, though, so I got back off and led her a short way down the trail before mounting up again. I’m pleased to report that the rest of the last loop went fine. No more lost boots, no more spooks, no more unscheduled dismounts. Linda kindly kept Ted an extra distance back, since Acey was a bit shaken, and we’d picked up a junior at the hold because her sponsor was pulled. As we rode, I had time to ponder the connections between Acey’s spooks — always something from behind, always a bolt followed by major bucks when reined in. I formed my theory about the bucking be a panic reaction to being constrained. I began planning to teach her a single-rein stop, and decided that if she bolted again, I would let her run a bit if possible and pull her up with pulsing instead of firm reins. We all returned to camp in good spirits. Acey’s energy remained high and she earned all A’s again, though I could tell by a hint of unevenness in her gait that she was finally getting tired. I couldn’t blame her! It was after 6:00 and she’d never travelled anywhere near that far before. All things considered, I was downright proud her. All day long, she was nothing if not game. She covered almost the entire ride, including the rocky 2nd loop, barefoot in back, and never took a bad step. Best of all, she had fun. So we have a couple issues to work through — hoof protection, behavior when spooked, excessive nervous energy in camp — but, all things considered, my hopes for the wee little firecracker are higher than ever. Well, we’re back from Fandango, and nobody died. As a bonus, we had a good time not-dying. We also learned some useful and challenging things about Acey. But wait. Shall we begin at the beginning? On Thursday morning, Acey loaded right up behind Consolation. I threw a couple bales of hay in behind her and off we went, down Highway 26 to the cutoff toward Wilder. Rain spattered the windshield as I drove. In the distance, stone-gray clouds lay thick over the canyonlands. Wind buffeted us as we wound along the 2.5 hour drive. I pulled over a couple times and hopped out to make sure Acey, who is sometimes tense during travel, was maintaining her composure. She was. The sky split as we pulled into camp. Spatters became deluge, then hail. I tested a couple parking spots, looking for somewhere level, not too far from the vetting area, not too crowded, and with plenty of space for Karen Bumgarner to join us with her two horses that evening. I settled on a spot sheltered by creekside trees, hunkered under the rain as I placed the blocks to level the camper, and spun the tires a little in fresh mud climbing up onto them. I set up the panel pens in a reduced drizzle, thorougly soaking my boots in the process. The girls unloaded nicely, if impatiently. I put Acey in the pen that was anchored directly to the trailer, rather than the second pen that was anchored to the first, just in case she decided to throw a fit. She circled the area a few times, tossing her mane and pausing to test the variety of semi-edible weeds, antsy but not crazed. So far, so good. 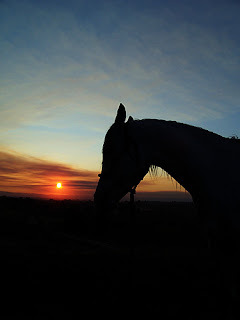 Overhead, the sky cleared and the wind began drying things out as I set up housekeeping for myself and the horses. Acey remained unsettled, but not too unsettled to eat and drink — nothing like as bad as Aaruba used to be. (You longtime readers will recall how he’d fling himself back and forth, clattering against the panels, never relaxing until nightfall. Ugh.) I pondered saddling her up for a little test ride across the creek, to see how she’d handle the water crossing, but decided not to given the restless weather and her state of mind. Better to face it in the company of other horses. Instead, I led Consolation down to the creek to stretch her legs and check out the water level. I was pleased to find it lower than I would have expected after the week’s weather. Consolation, however, was plenty high. She bounced around and hollered for Acey, who circled and screamed in agitation until we returned. Grrrr. This is why I really don’t like taking two horses to a ride. But, it was no worse than I’d anticipated. A pain for sure, but not a real problem. During the afternoon, I watched part of the Easycare booting demo, standing in the transient sunlight to let my Ariats dry. Kevin and company were showing how to glue on boots. Interesting…good to know… but what a process! I think I’ll stick to Gloves, thanks, as long as they’re working fine for 50’s. Meanwhile, I pondered my game plan. I had intended to ride Consolation on Day 1 and Acey on Day 2, leaving open the possiblilty of riding Consolation again on Day 3. However, Acey’s level of agitation made me reconsider. Perhaps she would be better served by blowing off some steam early instead of waiting in a pen for a whole day. Plus, the Day 1 vet checks were out of camp so we wouldn’t have to deal with buddy issues at every hold, and there were two holds scheduled instead of just the one planned for Day 2. Given her fitness level — which was on the low side of where I’d want to attempt a 50 — the extra rest time would be a good thing. The obvious downside was that if I put Consolation off until Day 2, it was less likely she’d be up for a second go on Day 3. On the other hand, that was a doubtful plan to begin with, and Karen had offered the possiblity of riding her backup horse Blue on Sunday if Consolation wasn’t up for it. Hmm. I had a feeling Acey’s first ride would be more, ahem, memorable than Consolation’s. Spoiler alert: I was right.